The orange-bellied parakeet is a small parrot found only in southern Australia. Adult males are bright green in color with blue wings, yellow underparts and an orange belly patch. Females are green and duller in color. They can grow up to eight inches long. The call of this parakeet is very unique. When alarmed, it gives a distinctive metallic buzzing call. Orange-bellied parakeets prefer salt marshland habitat in the winter and when ready to breed travel to South West Tasmania (which consists of temperate forest and moorland plains), where they nest in the holes of eucalypts trees. The female lays four to six eggs and only the female incubates the eggs. Diet consists mainly of seeds. Orange-bellied parakeets are social and are often seen in flocks, usually with one parakeet designated as a lookout to alert the other birds when there is danger. 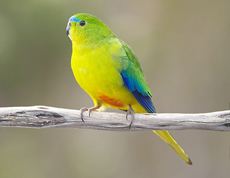 Once abundant and widespread throughout Australia, the orange-bellied parakeet is now a critically endangered species. The world population (in the wild) is said to be less than 50. In captivity only 208 individuals remain. The species has loss most of its preferred habitat due to overgrazing and urban development. They also compete for food with other introduced seed-eating finches, and they compete for nesting sites with the introduced common starling. An Orange-bellied parakeet Action Plan has been running since 1980 to monitor and possibly prevent the extinction of the species, and also, a captive breeding program was started in 2011. Copyright Notice: This article is licensed under the GNU Free Documentation License. It uses material from the Wikipedia article "Orange-bellied parrot". Glenn, C. R. 2006. "Earth's Endangered Creatures - Orange-bellied Parakeet Facts" (Online). Accessed 4/24/2019 at http://earthsendangered.com/profile.asp?sp=329&ID=4. Need more Orange-bellied Parakeet facts?